"I just ran across your blog while trying to find a new clutch cable for my 2005 Bullet 500. It seems I get two or three rides out of it before something else breaks. "When I do ride it, I sure get plenty of attention. The distinctive thumper sound was enough to disturb a movie shoot in downtown Jacksonville awhile back. 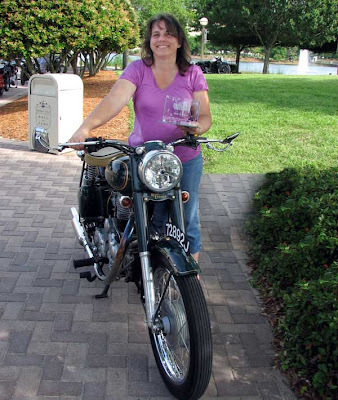 "I decided to drop you a line to say that I entered it on a whim in the Riding Into History classic motorcycle concours just outside of St. Augustine. The show's theme was Great Bikes of Great Britain and featured the finest old Broughs, Vincents, and huge numbers of Triumphs. "I've never owned a bike before and when I bought this, I'd never even ridden one. I still have a steep learning curve to climb. "Surprisingly, the show admitted my bike and even more surprisingly, it won the Best Modern British(?) bike category against assorted Triumphs, Nortons, and another Enfield. That was so unexpected that I didn't even attend the awards ceremony! "I must say that it made the many hours of detailing worthwhile (tap water has never touched it). My bike isn't a trailer queen although from its recent spate of breakdowns, it wants to be. I really need to read up on troubleshooting and repair basics before I set out to do what I first intended: pack up my plein-air painting kit and hit the road to paint the great outdoors. "Here I am with 'Absinthe' and award. I think I was as happy with the bike's good behavior that day as with the show results. In the background is the grand prize winning '38 Brough Superior with sidecar." Congratulations to Leigh and Abinthe, too. We're proud of you.